An incredibly high standard of care. Start by taking a 360° mini tour of our treatment room below. Campbelltown's Premier Tattoo Removal Clinic. Book your free consultation online today. 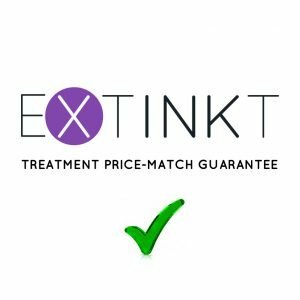 Extinkt deliver a premier service for tattoo removal in Sydney's Macarthur region. 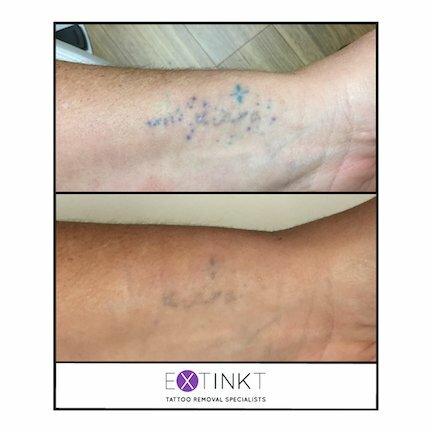 Our specialists operate medical grade lasers at multiple wavelengths, allowing us to treat a variety of tattoo colours. 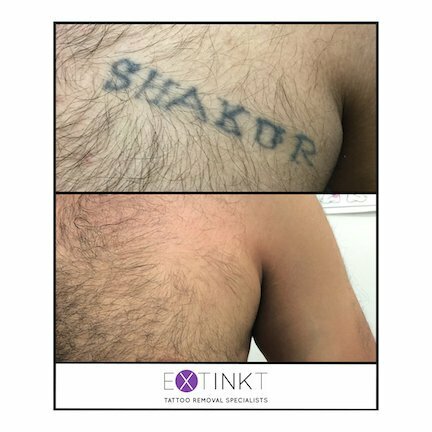 With extremely short pulses of laser light, we're able to break down the tattoo ink particles into much smaller fragments, allowing your body to naturally clear it away without any damage to surrounding tissue. A scar free service, we also offer complimentary skin rejuvenation for advanced healing and resurfacing of the treated area. As Campbelltown's dedicated specialists, we provide an exceptionally high standard of care, practicing with our clients safety, privacy and well-being as the top priority. Please feel free to take a tour of our clinic by using the Google 360° interactive image. You can also book an appointment online, use our contact form, or call us on 0478 776 561. Operating since 2016, we remain Campbelltown’s only specialist tattoo removal clinic and provide thousands of expert treatments each year. 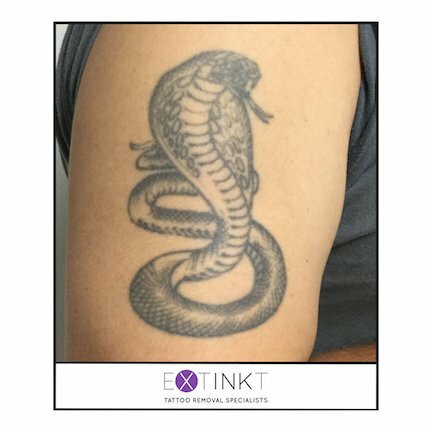 By delivering a service of the absolute highest standard, we aim to continue as a leading provider of tattoo removal in Sydney. We were very honoured to be recognised for our efforts soon after opening, accepting the award for Campbelltown’s Outstanding New Business of 2017. Our clients can be confident they are in good hands throughout their journey towards clean skin and are given the opportunity to have all questions answered during a free initial assessment. 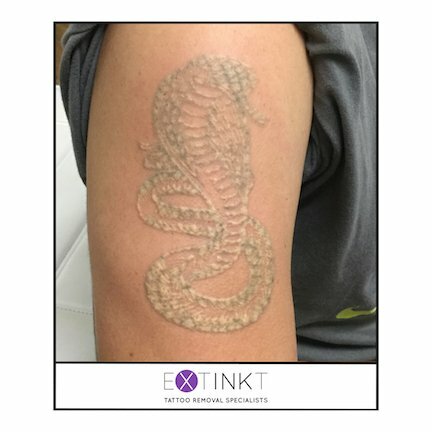 With an evidence based approach to practice, we have combined leading tattoo removal technology and treatment techniques with an excellent level of customer service that set the standard high for our industry. Please browse through some of our recent results here. 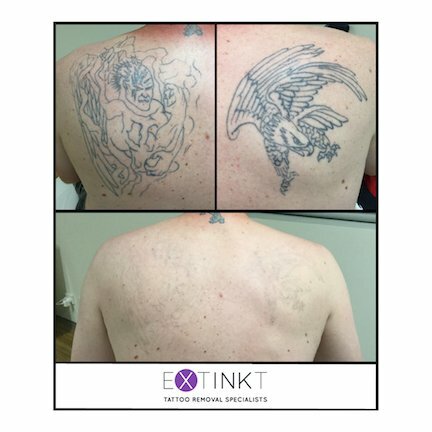 Extinkt are proud to deliver a premier service for tattoo removal in Sydney's Macarthur region. 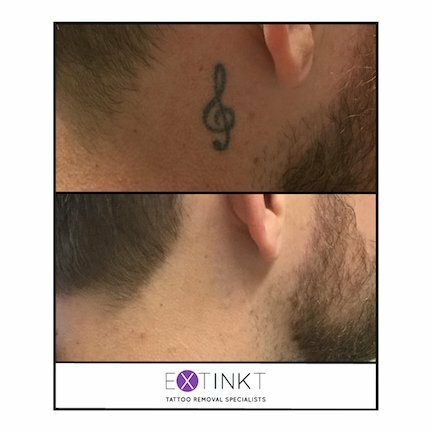 Our specialists operate medical grade lasers at multiple wavelengths, allowing us to treat a variety of tattoo colours. 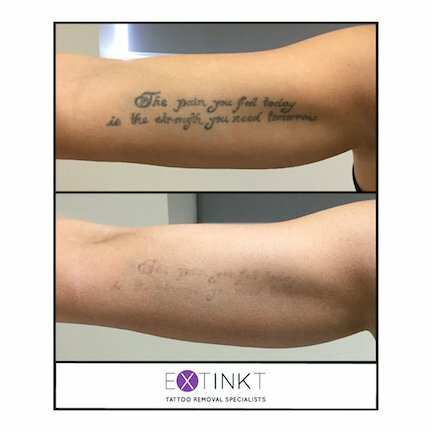 With extremely short pulses of laser light, we're able to break down the tattoo ink particles into much smaller fragments, allowing your body to naturally clear it away without any damage to surrounding tissue. A scar free service, we also offer complimentary skin rejuvenation for advanced healing and resurfacing of the treated area. As Campbelltown's dedicated specialists, we provide an exceptionally high standard of care, practicing with our clients safety, privacy and well-being as the top priority. If you'd like any further information please enjoy browsing our site! You can also book an appointment online, use our contact form, or call us on 0478 776 561. 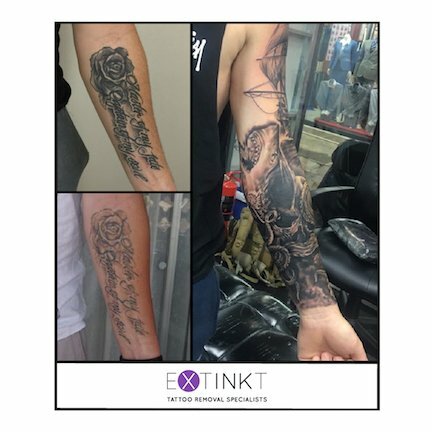 Extinkt Tattoo Removal Campbelltown were the first to operate as a dedicated, specialist clinic providing laser tattoo removal in Sydney’s South West. 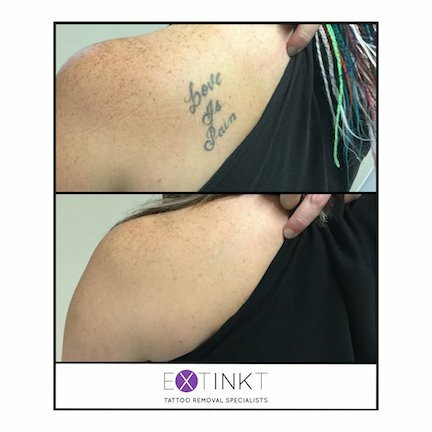 Our journey began with our own tattoo removal, so we whole heartedly understand the clients needs, as we’ve been in the same position! 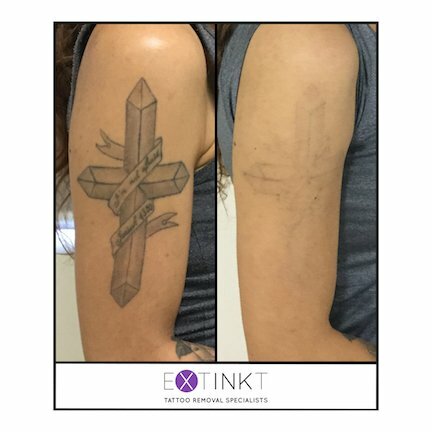 Our specialists will educate and guide you through your tattoo removal based on their very own experiences. We’ll cover everything necessary, ensuring our clients are in the best possible hands. When you’re ready to visit, we’re located in Park Central, Campbelltown. If need be, you can also find us on Google, or Apple Maps. We are extremely confident in our machine, having invested in Quanta’s Q-Plus C EVO. The amount of evidence for complete scar free removal with this technology is overwhelming, and unrivalled worldwide. Additionally, the brand new handpiece allows for faster healing, and resurfacing of the skin (rejuvenation). 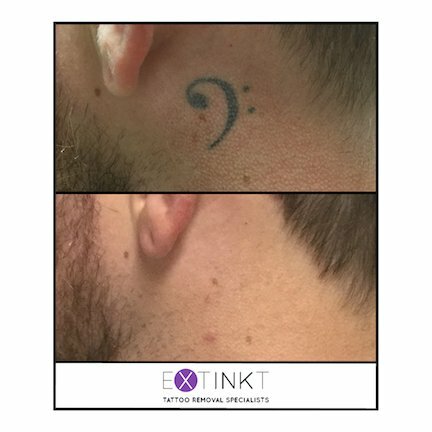 It’s rare for this extra service to be offered with tattoo removal in Sydney, currently only available in a few clinics Australia wide. Our machine also reduces the risk of hypo-pigmentation (lightening) in the skin, which can sometimes occur. 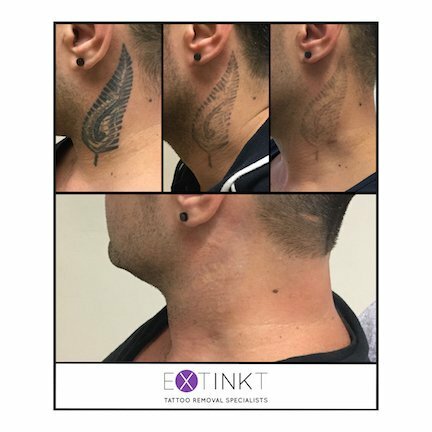 Together with the Koolio Optimal Air Cooling System and trained specialists, we provide premium laser tattoo removal for Sydney of the highest quality. Our tattoo removal treatments start from $70 for extra small tattoos, and this price increases as the tattoo gets larger. All clients receive a maximum payment guarantee largely determined by their estimated number of treatments. Should you reach this, we’ll happily provide free service for up to 12 months. If you’d like, you can set up an interest free payment plan which is a great way to budget the cost of your tattoo removal, paying it off during the time between treatments. 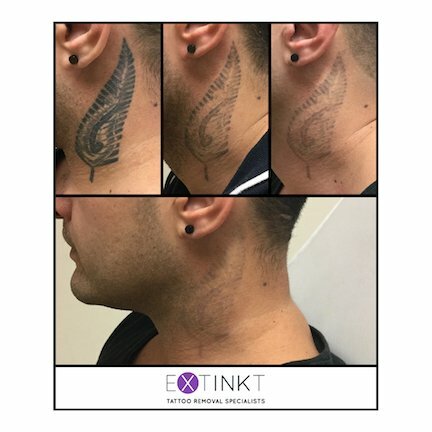 Fortunate Anytime Fitness members have access to an exclusive offer, and we also provide a variety of discounts to all clients, making us the most competitive price for laser tattoo removal in Sydney. 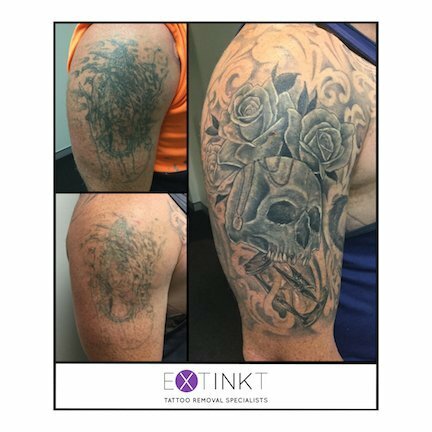 Extinkt are proud to deliver a premier service for tattoo removal in Sydney’s Macarthur region. 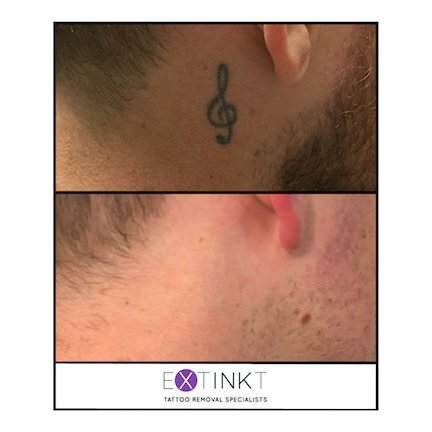 Our specialists operate medical grade lasers at multiple wavelengths, allowing us to treat a variety of tattoo colours. 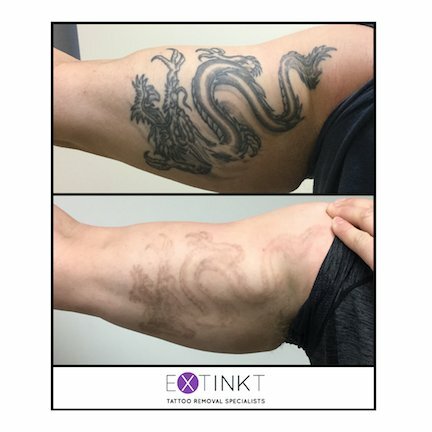 With extremely short pulses of laser light, we’re able to break down the tattoo ink particles into much smaller fragments, allowing your body to naturally clear it away without any damage to surrounding tissue. A scar free service, we also offer complimentary skin rejuvenation for advanced healing and resurfacing of the treated area. As Campbelltown’s dedicated specialists, we provide an exceptionally high standard of care, practicing with our clients safety, privacy and well-being as the top priority. If you’d like any further information please enjoy browsing our site! You can also book an appointment online, use our contact form, or call us on 0478 776 561. Our Biggest Offer To Date. 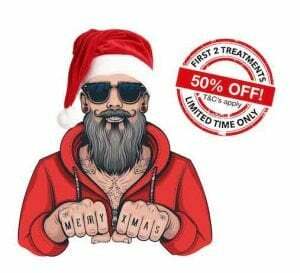 This Christmas, we’re offering a very limited number of clients the opportunity to receive 50% off their first 2 tattoo removal treatments! Be one of the first 20 new clients to book your appointment with us this December to receive your first and second treatments at half price. This offer is extremely limited and we don’t expect it to last long! Be sure to get in touch as soon as you can to arrange your appointment. You can use our online system to book in or call through on 0478776561. This is by far our biggest offer to date and is a great opportunity to start your tattoo removal at seriously affordable prices. Double the value, double the result, for half the price! A few terms & conditions do apply so please ask in store for details. We also have Christmas Gift Vouchers available starting at just $20, a great way to help a loved one start their journey back to happy skin. 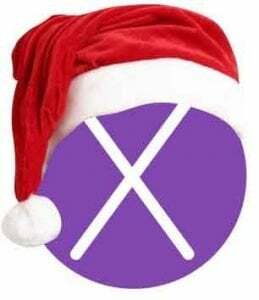 Extinkt are committed to maintaining our position as a premier provider of laser tattoo removal in Sydney, and would like to wish everyone a Merry Christmas! Please head over to our Facebook page to see more of our activity. When you’re ready to say goodbye to your ink, don’t hesitate to get in touch. Please feel free to use our online booking system, where selected appointments have been made available for your convenience. You can book a free consultation or returning treatment session at any time through our online system. If the times listed don’t fit in with your schedule, we do also have other times available. You can fill out our contact form, or give us a call on 0478 776 561. 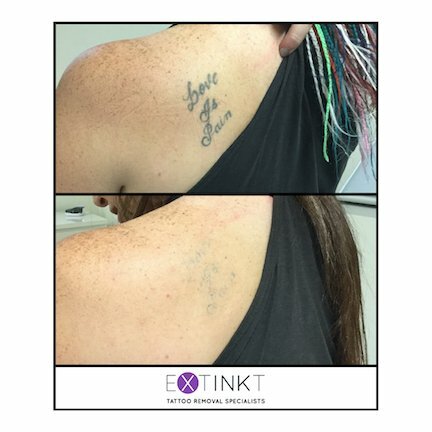 Don’t forget, we’re more than happy to provide you with a test patch before you go ahead with your first full tattoo removal treatment. We look forward to welcoming you to South West Sydney’s Premier Laser Tattoo Removal Clinic. What are you waiting for, you’ve got nothing to lose, except your tattoo! 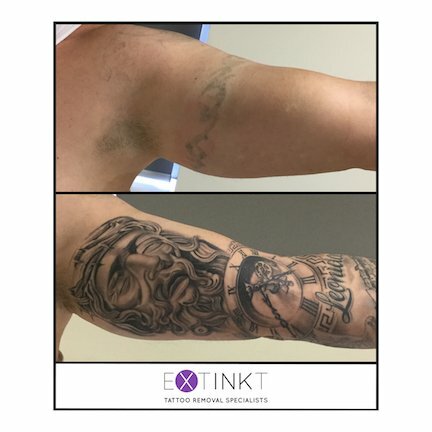 At Extinkt, we are very proud to offer a premium laser tattoo removal service at the first dedicated tattoo removal clinic in South West Sydney. 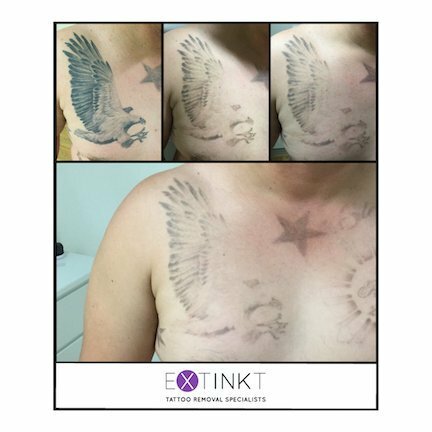 Our combination of first hand experience and specialist tattoo removal training gives us the ability to provide our clients with the information they deserve, and should expect when considering their own removal. Like the best professional health services, we operate with the client’s safety, privacy and well being as our number one priority. We are certified in the safe use of cosmetic laser and light therapies, and have extensive training provided direct from the manufacturer in the use of Q-switched laser technology and more specifically, in the use of our machine, the Quanta Q-Plus C Evo. Before opening our doors to the public we had provided many treatments and continue to see new clients every week. 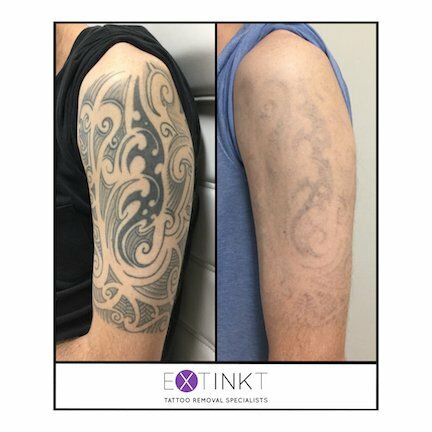 Investing in the most advanced laser technology available, we are committed to remaining as one of Sydney’s leading laser tattoo removal providers. 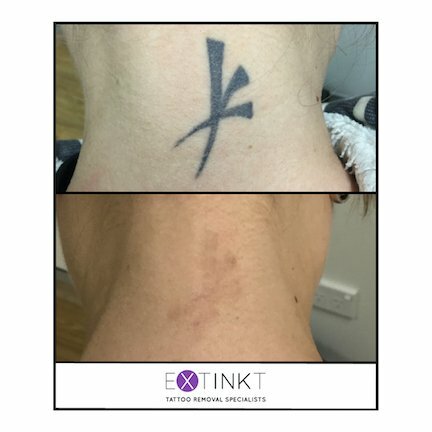 We maintain a healthy relationship with the manufacturer and continue to monitor the best available evidence when considering all areas of tattoo removal. 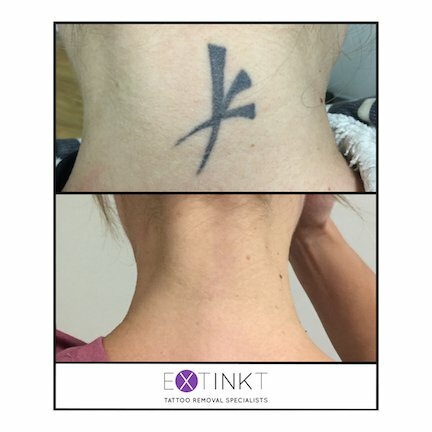 The decision to begin tattoo removal should not be taken lightly, which is why it is important to us to provide our clients with everything they need to know before their first treatment. This is offered by means of a free, no obligation consultation. During this meeting our specialists will educate and guide you through your removal process based on not only clients they’ve treated, but also their very own experiences, ensuring you are in the best possible hands. 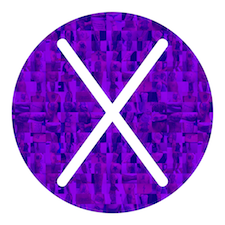 "I cannot say enough about Matt and the team from Extinkt. Their expertise is second to none, but more importantly their service is incredible. They talk you through every step of the way and follow up to ensure everything’s going as planned. After one session I can already see better results than I've had from several sessions elsewhere. Cannot recommend these guys enough!" 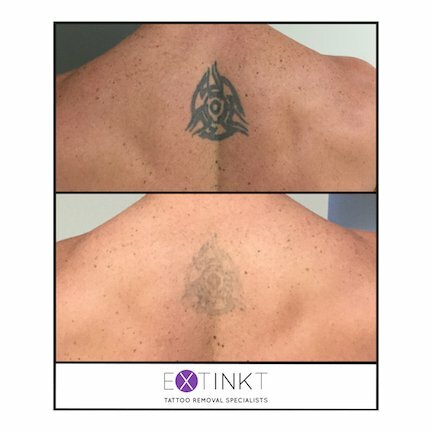 "If you have considered laser tattoo removal I'd definitely recommend the team at Extinkt. Matt and Joel have been honest throughout my treatment process as well as providing me with a realistic and affordable treatment plan. 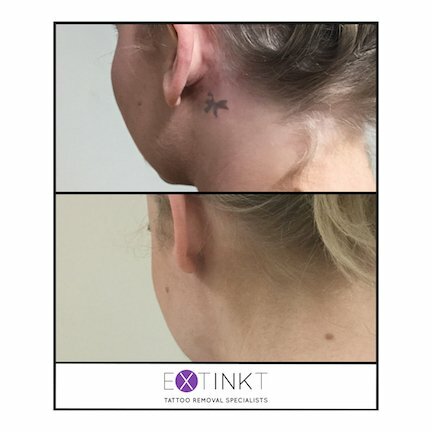 "I went to Extinkt Tattoo Removal after an unhappy experience at another removal practise. Not only were they very professional, but they actually care about their clientele. The initial consultation answered all my questions and put my mind at ease. The process itself was 50 % less painful than my previous treatment. They even gave me an aftercare package and followed up with a call a day later to see how I was. 2 sessions with Extinkt was enough for me to cover over with a new tattoo. I would highly recommend them." We wanted to let you know some more information about the owners and treatment providers at our Campbelltown location, delivering our service as South West Sydney’s Premier Clinic. We’re now approaching the midway point in our second year of trading (we’re growing up so fast!) and for all those who haven’t met us yet, we’d like to introduce you to your specialists. If you already have, we might yet surprise you with something you didn’t know! 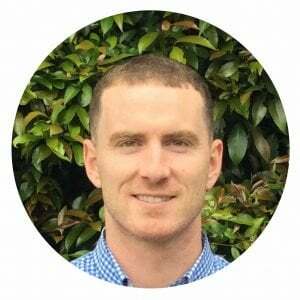 Passionate about health and exercise from a young age, Joel completed a Bachelor of Health Science in Sydney in 2014 and proceeded to work in an environment surrounded by extreme sports and recreational activities. Joel enjoys travelling when he has the chance and listening to a wide variety of music in his spare time. 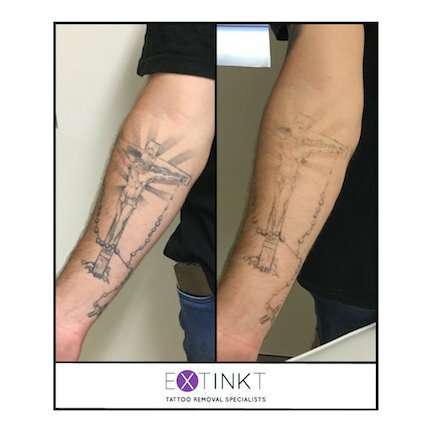 As part of a company who’s primary objective was to turn ideas into achievements, and with an education in health, Joel helped develop the concept that became Extinkt Tattoo Removal in Sydney’s Macarthur region, and continues to aid a growing number of people in the community on their way to removing unwanted tattoos. 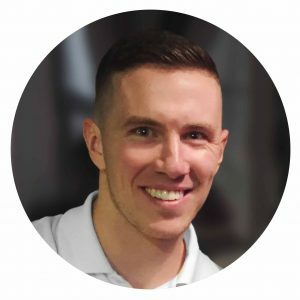 Spending a number of years in the United Kingdom pursuing a career in soccer, Matt completed a Bachelor of Science with Honours in Liverpool. He then returned home to continue his studies, and is a current Doctor Of Physiotherapy Candidate at Macquarie University, with graduation just around the corner. 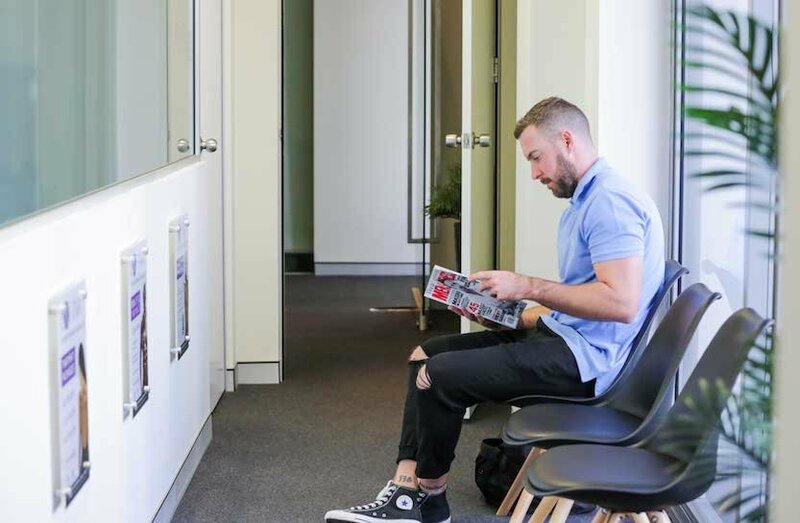 Matt picked up a number of tattoos on his travels and became passionate about providing our service when beginning his own tattoo removal in Sydney 3 years ago, aiming to fade some older ones for new work. Although quite busy, he still loves his soccer and is hoping to start playing again next season! 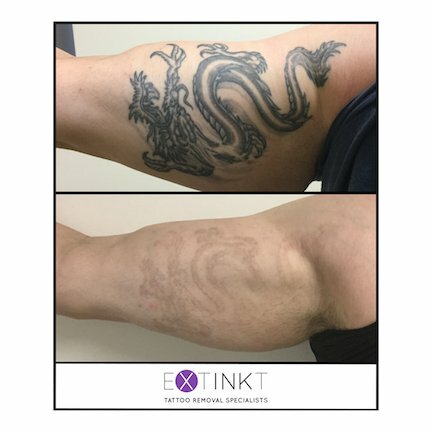 As co-owner of Extinkt, Matt’s role is to help others once again be happy with their skin, by providing a scar free alternative to living with tattoo regret. 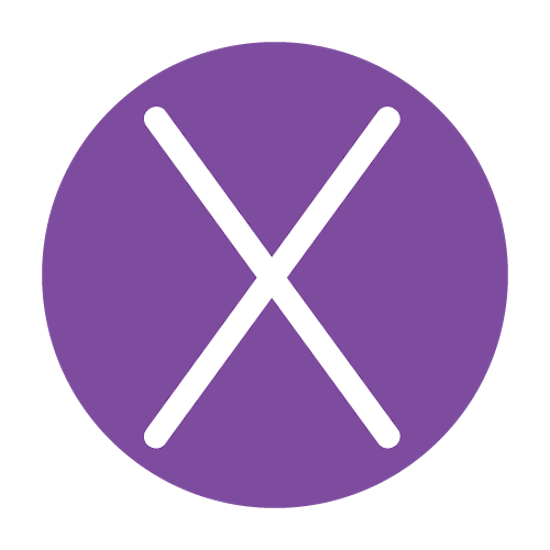 With both Extinkt members having backgrounds in higher education, an evidence-based approach to treatment was an essential part of the decision to found our company. 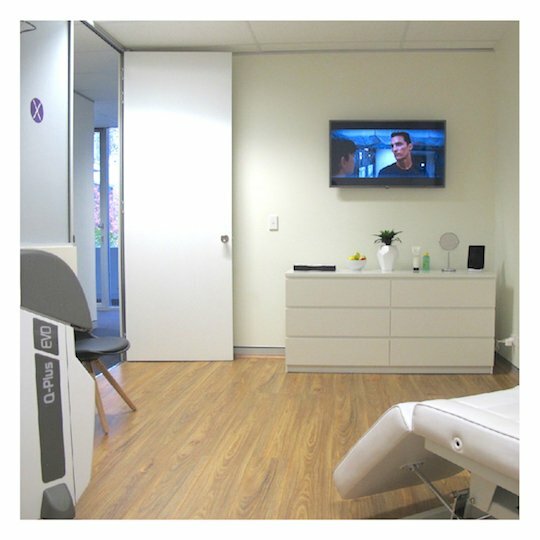 An overwhelming and unrivalled amount of evidence for complete scar free removals lead to our investment in Quanta’s Q-Plus C technology, and we were lucky enough to be the first in New South Wales to operate the latest model in the EVO, which you can learn more about here. We hope you’ve enjoyed this brief introduction to your Extinkt staff members! We look forward to chatting with you again soon. 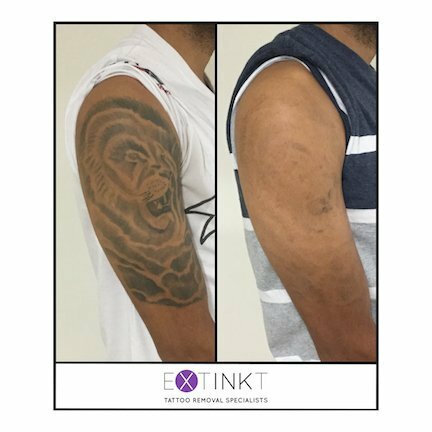 As a premier provider of laser tattoo removal in Sydney, Extinkt deliver an exceptionally high standard of service for the Campbelltown region. Contact us today to arrange your free consultation and test patch.